Enlarge / New box on the left; original box on the right. Though the new box includes a UK-specific “PEGI” rating designation, this new box appears in a brand-new “SKU” on Amazon’s American site, as well, and the game’s original SKU has had its “platform” removed, suggesting that it may be a discontinued version. 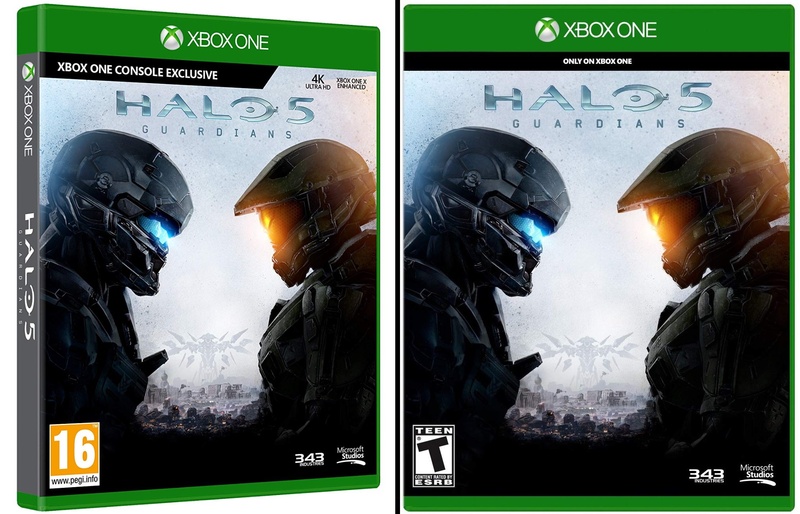 A weekend update to Amazon’s listing for Halo 5: Guardians included an enticing, and clearly intentional, change to its box art: a new “Xbox One console exclusive” label. The phrase appears not once, not twice, but thrice via cleanly rendered angles of a physical box, and it replaces the original 2015 box’s “only on Xbox One” descriptor. Microsoft’s “Xbox Play Anywhere” initiative formally launched in late 2016 with the third-person platformer ReCore. The program has since included every first-party Microsoft game on Xbox, allowing those games to work either on any Xbox One system or any Windows 10 PC. (By arriving one year earlier, Halo 5 missed the Play Anywhere cut.) Recent games in the program, including this year’s State of Decay 2 and Sea of Thieves, feature the same “console exclusive” tag on their Xbox One boxes and also run on Windows 10. Up until now, Halo faithful have had a few less-than-ideal options to play the game’s first-person offerings on Windows PCs. Halo 5‘s “Forge” standalone mode has a free, official Windows 10 version, and it includes support for multiplayer combat on custom Halo 5 maps—but this requires jumping through some substantial hoops, including fully manual matchmaking. (That means you’ll need to find a Discord server and exchange Xbox “gamertags” that way.) There’s also a fan-patched version of the Russia-only 2015 release Halo Online, which Microsoft has decried (yet also left somewhat untouched). Neither of those includes a “campaign” mode, however. For that on PC, you’ll have to rewind to 2007’s Windows Vista port of Halo 2, handled by then-upstart PC game developer and port specialist Gearbox Entertainment.